Navratri meaning ‘Nine Nights’ is one of the most popular Hindu festivals celebrated in the country. The fun-filled nine-day long festival is dedicated to Goddess Durga and her nine avatars, also known as Navdurga. 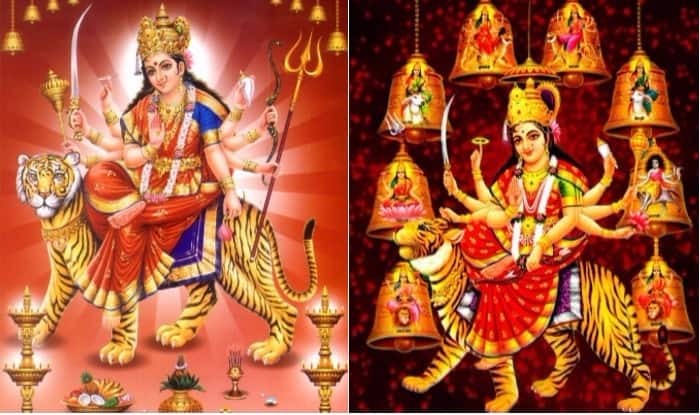 There are five types of Navratri with Sharad Navaratri being the most important ones as it marks the celebrations of big festivals such as Durga Puja and Dussehra. Sharad Navratri 2017 will begin from September 21, until September 29 with Dussehra or Vijaya Dashami celebrated on September 30, 2017. The exciting festival also spelt as Navaratri or Navarathri is commemorated on a grand scale across India. It is important to worship each form of Goddess Durga on keeping few things in mind such as – correct Navratri celebrations date, muhurat timings, colours to wear, mantras to chant, pictures or idols with proper puja vidhi (rituals). 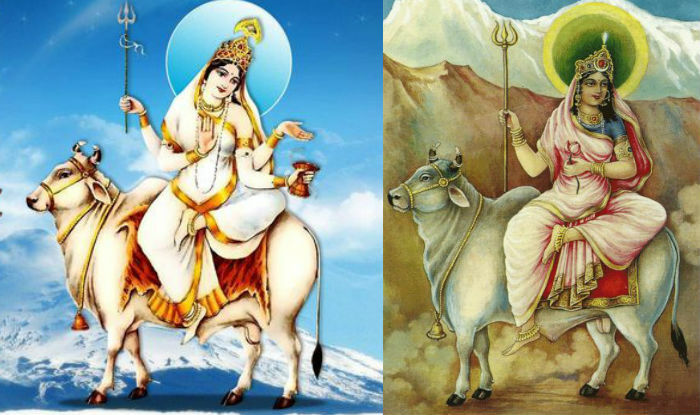 The festival is the celebration of the Navadurga – Devi Shailputri (Navratri Day 1), Devi Brahmacharini (Navratri Day 2), Devi Chandraghanta (Navratri Day 3), Devi Kushmanda (Navratri Day 4), Devi Skandamata (Navratri Day 5), Devi Katyayani (Navratri Day 6), Devi Kalaratri (Navratri Day 7), Devi Mahagauri (Navratri Day 8) and Devi Siddhidatri (Navratri Day 9). 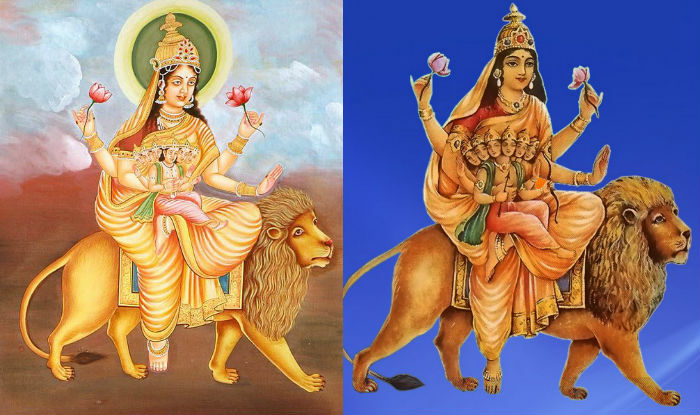 We take a look at each avatar of Goddess Durga, their significance, mythological stories about them and holy mantras chanted during the Navratri festival celebrations. Sharad Navratri will commence with Ghatasthapana, also known as Kalash Sthapana on Pratipada (the first day) on September 21, 2017. The first day of Navratri is dedicated to Devi Shailputri, the first form of Goddess Durga. She is the daughter of Himalaya with the name Shailaputri being a combination of words, Shail (mountain) and Putri (daughter). In her previous birth, she was Sati, the daughter of Daksha. As Sati, she had immolated herself after her father insulted her husband and Lord Shiva. After taking rebirth as in form of Goddess Parvati, she married Shiva seeking blessings from her father. The iconography of this avatar of Goddess Parvati is – rides a bull, carries a Trishul (trident) in her right hand and a lotus flower in her left hand. Devotees must offer fresh Jasmine flowers to Devi Shailputri as it is her favourite. 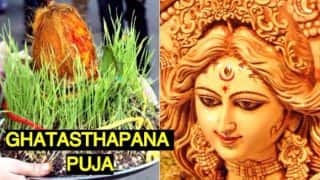 Mantra to Worship Devi Shailputri: ॐ देवी शैलपुत्र्यै नमः॥ Om Devi Shailaputryai Namah॥ While worshippers are advised to wear red coloured outfits for Devi Shailputri Puja but the colour of the Navratri 2017 Day 1 is Yellow as Pratipada falls on Thursday (Navratri Colours are decided based on weekdays, the festivals begins on). Maa Shailputri is believed to govern the Moon. In Hindu scripture, the description of the second form of Navdurga is given as “Goddess Brahmacharini wears white colour clothes, she holds rudraksha mala, lotus flower, kamandalu, in her hands. 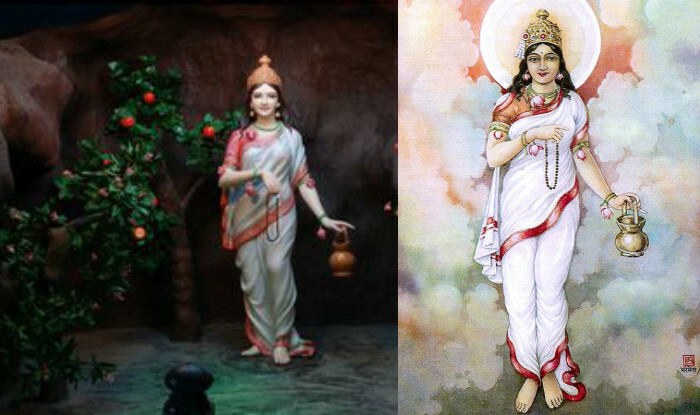 Goddess Brahmacharini is the “tapaswani” roop of the goddess… who gives freedom from Kaama and krodh.” She is worshipped on day two (Dwitiya) of Navratri. 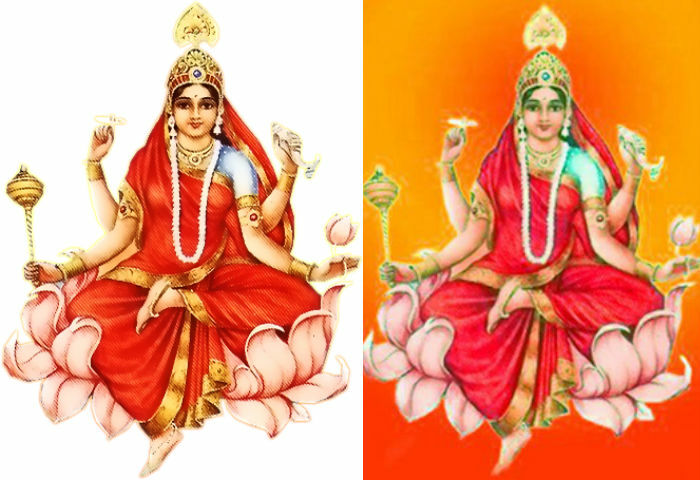 Maa Brahmacharini is believed to govern Lord Mangal (Planet Mars), the provider of all fortunes. To please this form of Goddess Durga, chant this simple mantra: ॐ देवी ब्रह्मचारिण्यै नमः॥Om Devi Brahmacharinyai Namah. Her favourite flower is also Jasmine. Devi Chandraghanta is worshipped on the third day (Tritiya) of Navratri. Her name Chandraghanta means “one who has a half-moon shaped like a bell. Her third eye is always opened and she always ready for war against demons”. The ten-handed Goddess is depicted mounting a tiger. 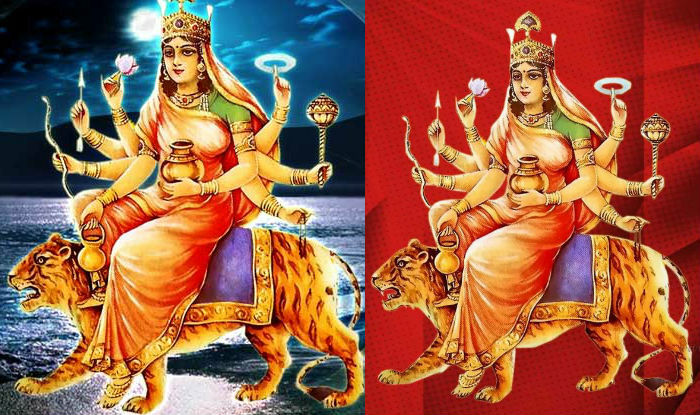 In her four left hands, she is seen carrying Trishula(trident), Gada(mace), khadak (sword) and kamandal (water pot) while the fifth left hand is in Varada Mudra. In her right hands, she holds Kamala (lotus flower), Ghanta (bell), bow and arrow with the fifth right hand in Abhaya Mudra. She is also fond of Jasmine flower and must be offered during puja. Mantra to please Devi Chandraghanta is – ॐ देवी चन्द्रघण्टायै नमः॥ Om Devi Chandraghantayai Namah. She governs the Lord Shukra (Planet Venus). Devi Kushmanda is worshipped on the fourth day (Chaturthi) of Navratri. Her name is broken down to define her role – Ku means “a little”, Ushma means “warmth” or “energy” and Anda means “cosmic egg”. According to the Hindu mythology, it is believed that the universe was created by Goddess Kushmanda with her dazzling smile. She is said to have the power to provide energy to the Sun, hence also rules the celestial body. A devotee must do Kushmanda Puja with complete dedication as she is the one who created the Universe. Mantra to chant on the festival day: ॐ देवी कूष्माण्डायै नमः॥ Om Devi Kushmandayai Namah. The devotees must offer red flowers to the lioness mounting Devi Kushmanda. On the fifth day (Panchami) of Navratri festival, devotees worship Goddess Skandamata. 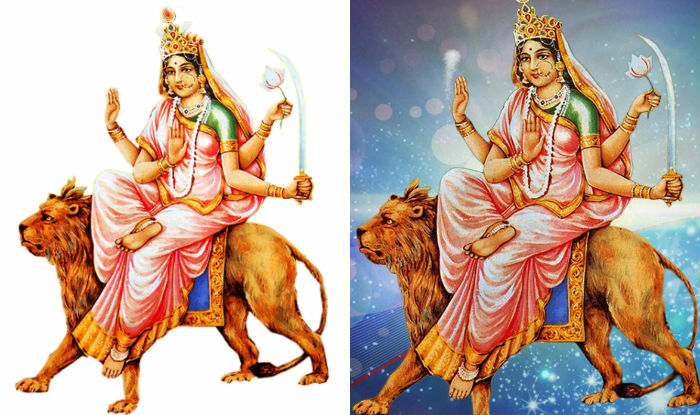 She is depicted as riding a fierce lion, carrying Lord Kartikeya in baby form. She holds lotus flowers in her upper hands while keeping the right hand in Abhaya Mudra. Mata Skandamata is believed to govern Budha (Planet Mercury). Devotees must revere Maa Skandamata by chanting this mantra: ॐ देवी स्कन्दमातायै नमः॥ Om Devi Skandamatayai Namah॥ and offering red coloured flowers. Goddess Katyayani is worshipped as the sixth form of Goddess Durga on the sixth day (Shashthi) of Navratri festival. 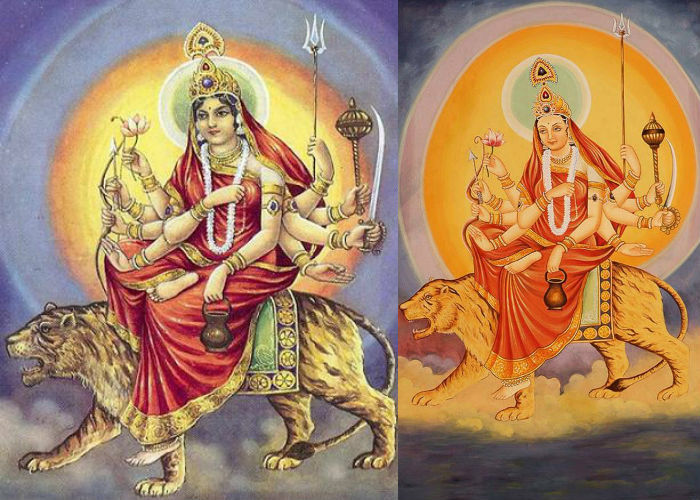 In order to **** the King of Demons, Mata Parvati took the form of Maa Katyayani, which is considered her fiercest form. Addressed as the warrior goddess, Devi Katyayani gives strength to her female devotees to lead a righteous and troubled free life. Young women also observe fast and do Katyayani Puja to please the Devi to seek blessings of a happy married life. Chant this mantra: ॐ देवी कात्यायन्यै नमः॥ Om Devi Katyayani Namah and offer red flowers especially roses to please the Goddess. She is believed to govern Bṛhaspati (Planet Jupiter). She is described as dark as night and ferocious warrior goddess who scared the living daylights of evil spirits in the universe. On the seventh day (Saptami) of Navratri festival, Maa Kalaratri is worshipped with great enthusiasm. She is considered one of the most destructive forms of Goddess Kali, Mahakali, Bhadrakali, Bhairavi, Mrityu, Rudrani, Chamunda, Chandi and Durga. Mounting on top of a donkey, the four-handed Goddess is seen carrying an iron shackle and sword while her right hands are in Abhaya and Varada Mudra. 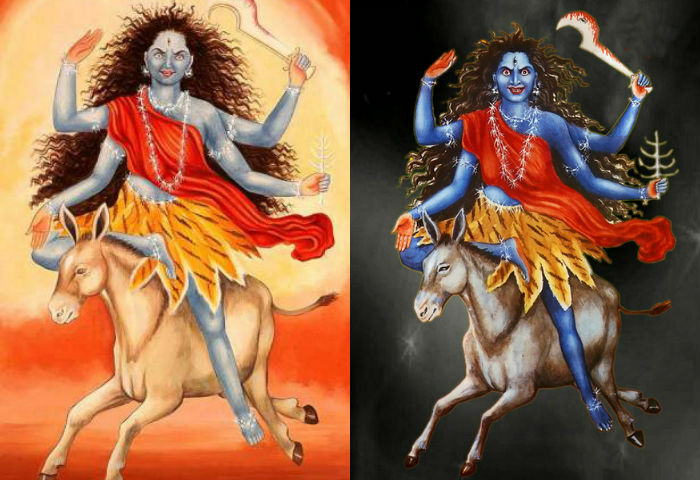 Kali bhakts (devotees) must chant this mantra for Maa Kalaratri: ॐ देवी कालरात्र्यै नमः॥ Om Devi Kalaratryai Namah while offering night-blooming jasmine flowers. She governs Lord Shani (Planet Saturn). 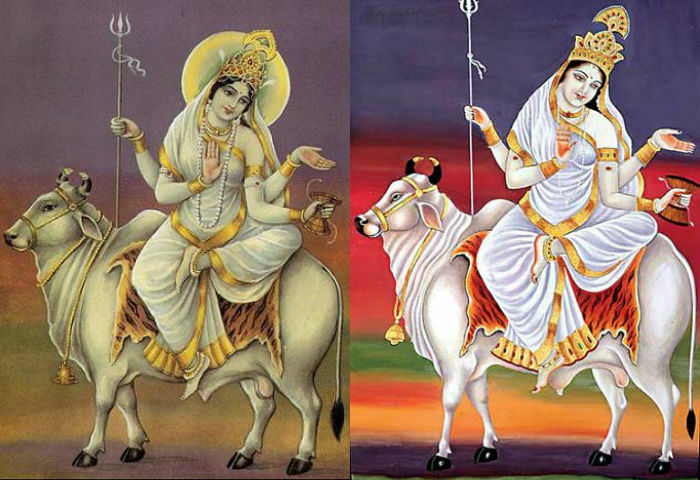 The eight form of Navdurga worshipped during the festival is Mahagauri. She is worshipped on the eighth day (Maha Ashtami) with devotees offering night-blooming jasmine flowers. She is described as extremely fair in complexion, adorning only white clothes earning her the name of Shwetambardhara. She has four hands and she rides a bull. The eighth day of Navratri is highly auspicious with Mahashtami, also known as Maha Durgashtami celebrated with fun and fervour. Mahashtami 2017 will fall on September 28. Devotees must chant this mantra to please Mahagauri, the ruler of planet Rahu: ॐ देवी महागौर्यै नमः॥ Om Devi Mahagauryai Namah. The ninth and last manifestation of Goddess Durga worshipped on the ninth day (Maha Navami) of Navratri festival is Devi Siddhidatri. The iconography of this form of Maa Durga is that she has four hands holding a discus, conch shell, trident and mace. She sits on a fully bloomed lotus and rides a lion. She rules planet Ketu by providing it direction and energy. The ninth day puja for Devi Siddhidatri is quite important as she is Goddess who has the power to fulfil any wish and grant all type of Siddhis to her devotees, so much so that, even Lord Shiva has got all Siddhis bestowed upon by the grace of Goddess Siddhidatri. Offer Night blooming jasmine flowers while chanting this mantra: ॐ देवी सिद्धिदात्र्यै नमः॥ Om Devi Siddhidatryai Namah. We wish everyone observing and celebrating the various forms of Goddess Durga, a very happy and auspicious, Navratri.